Nobuchi (Masayuki Mori) is a scholar who does not work. Practically the only time he leaves the house is to visit the grave of his friend Kaji (Tatsuya Mihashi). Although thoughtful and of even temper, he has a sour outlook on life, is distrustful of others, and is dismissive towards his wife Shizu (Michiyo Aratama), who longs to be let in. His only friend is the student Hioki (Shôji Yasui), who looks up to Nobuchi as a “sensei”. Nobuchi is clearly haunted by something, and after the death of Emperor Meiji — and the subsequent suicide of General Nogi — he decides it is time to trust Hioki and reveal his troubled past. 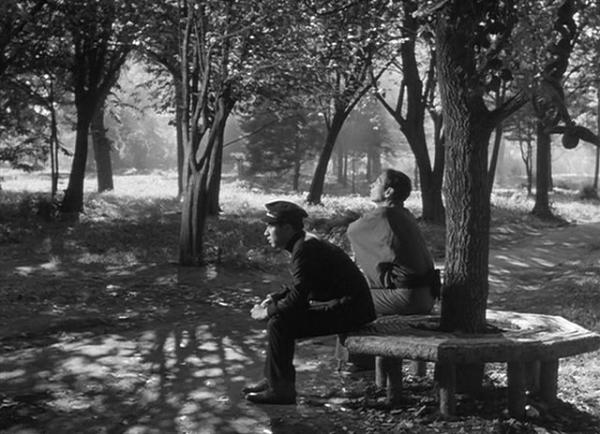 This film comes nine years into Kon Ichikawa’s career as a director, but it is the earliest I’ve seen so far. A year later he would direct one of his acknowledged masterpieces, The Burmese Harp. The two movies share some similarities, both presenting a psychological mystery and gradually revealing what brought the main character to his current state. This earlier film is less canonized (although it was released by the prestigious Masters of Cinema company in the UK) but I would call both of them films of significant value and mastery. To say too much about what is revealed about Nobuchi’s past would rob you of the experience of having it so elegantly unfold. Through flashback we first learn the nature of how Nobuchi met Hioki, and later we take an extended break from the present to explore the complex history of Nobuchi and Hioki. Even at the end when supposedly all is revealed, there is an ambiguity remaining, something left unsaid that gives the story more tragic depth. This entry was posted on February 1, 2015 at 3:58 pm	and is filed under Movie Reviews. You can follow any responses to this entry through the RSS 2.0 feed. You can leave a response, or trackback from your own site.